Quest Diagnostics wanted to consolidate over 30 legacy products they currently use in their lab ordering process into one web application. The team at Code & Theory had to build a foundation that would allow it to expand in function and serve multiple types of users. As the lead UX designer I had many responsibilities on the project including owning UX deliverables, leading client workshops, managing a junior UX designer, meeting deadlines, collaborating with multiple teams (internal and external), and presenting work to all stakeholders. In the early stages of the process, primary and secondary research methods were used to understand Quest’s product ecosystem, the clinical laboratory market, and the user needs. The findings resulted in a service blueprint, a strategic direction, and clear insights about the end user. The primary research was crucial to the process as it helped identify two primary user groups and their needs; physicians and physician’s assistants. While one group prioritized speed in their process, the other required accuracy. This challenge had significant implications on the structure of the solution. To accommodate these needs, we included the ability to skip steps within the primary flow, but store this data and provide timely reminders. This challenge was fascinating because it had significant effects on flows and data inputs that were decades old. 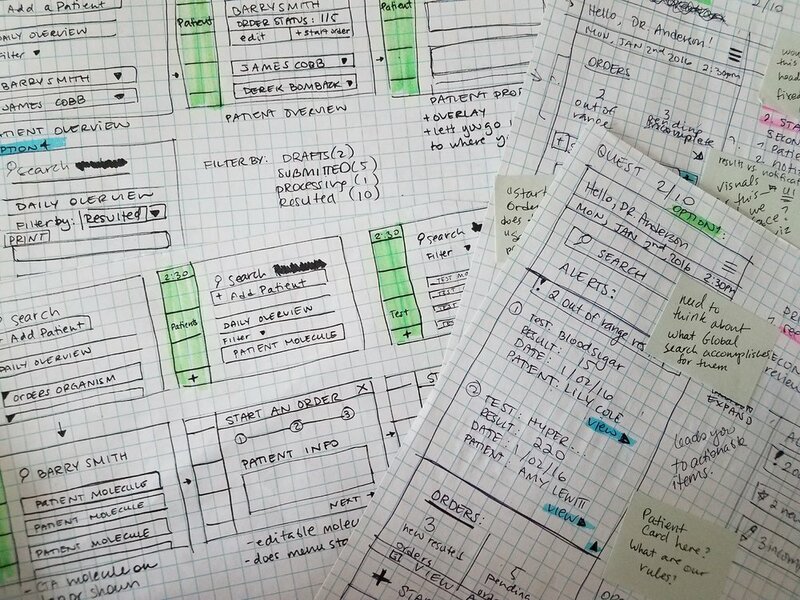 To support the scalability of the system, atomic design methodology was used to ensure that the UI elements would be modular enough for reuse and growth. This methodology also had a great effect on our workflow by enabling all members of the team to reference design elements quickly and precisely. This systematic and modular approach to designing an application embedded growth and sustainability in its DNA, ensuring that Quest received powerful tools and not one-off concepts. 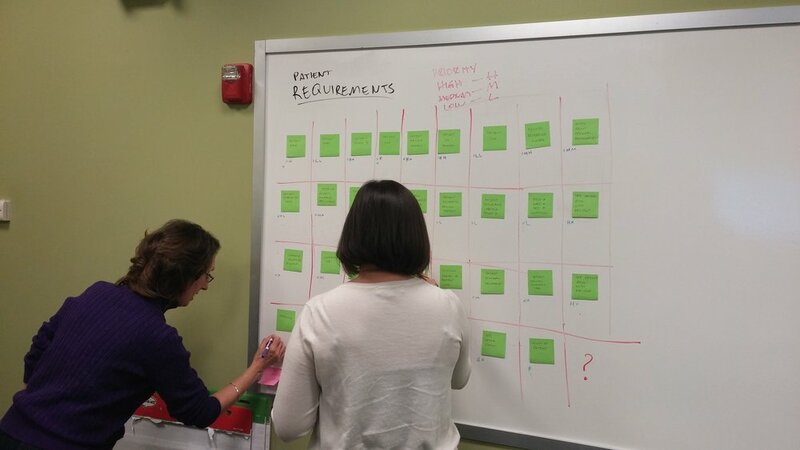 Each sprint included a two-three day client workshop where we reviewed requirements and ideated together. These participatory design sessions not only strengthened the relationship between client and agency, but meant that the whole team was aligned in the sprint. As the lead UX designer, I created a cadence where early ideation and iteration was a precursor to any digital documentation. This generated difficult and productive questions, and made wireframes concise documents that didn’t require as much tweaking and could be produced with confidence. The challenge in this part of the process was managing the feedback from the large number of stakeholders involved in a project of this scale; compliance, security, engineering, design, marketing, and leadership. The final designs included radical concepts that were crucial to test with end users. We had an opportunity to perform usability tests with physicians and get clarity on these concepts as well as some open questions. This was a step that was crucial to the continued build of the product, and measured the health of what was already conceptualized. I worked as part of a talented team at Code & Theory to provide Quest Diagnostics with a system that met their user’s needs and business goals. We asked difficult questions to ensure the integrity of the product and equipped Quest to provide their customers with a solution of the highest caliber. The complexity of the system, the logistics of the project, and the potential impact of the solution were challenges that helped me grow exponentially as a designer.